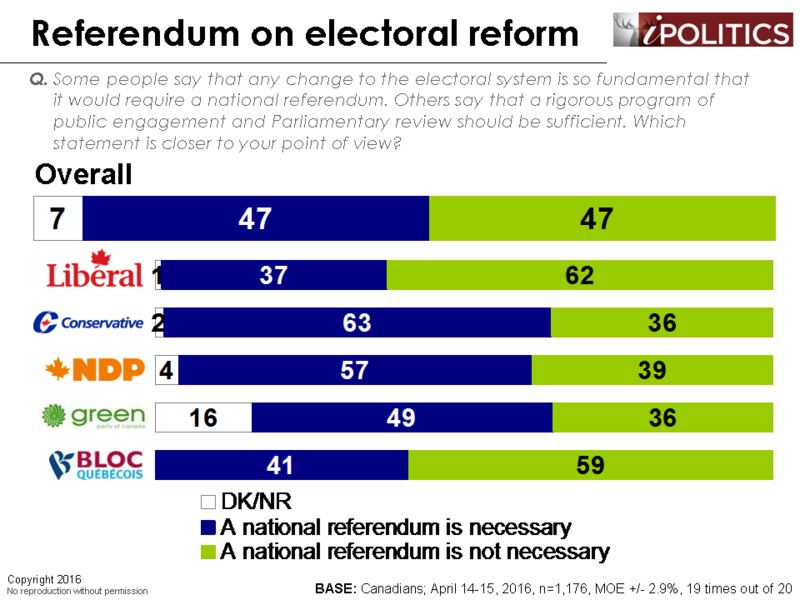 [Ottawa – April 19, 2016] We could speculate that the recent rise in trust in government might dampen the urgency associated with electoral reform, which leads to the question of whether it would be worth the thorny problem of opening up electoral reform at this time. Our research shows that the public at this time are still uncomfortable with the current first-past-the-post system, preferring instead some modified form of proportional representation. On the question of electoral reform and whether a referendum would be necessary, there is no clear consensus. In fact, quite the opposite – Canadians are dead split between those who think a referendum would be necessary and those who think it would not be necessary. Unsurprisingly, Liberals are content to leave the matter in the hands of the federal government. Conservative and NDP supporters, however, insist that such a fundamental issue should be decided by the people, not Parliament. 10 comments to Do We Need a Referendum on Electoral Reform? Why does everyone in the media talk up the proportional option rather than the transferable ballot. At least it would give us a likely majority gov’t and not the interminable conflict and gamesmanship of the minority Parliament? Oh, I think I just answered my own question. With the possibility of a majority somewhere between slim to zero for most election cycles under a proportional representation system, do you think that MPs would, at least eventually, learn to get over their majority fixation and instead figure out ways to compromise and collaborate a bit more? Great that Canadians are turning on first past the post. What took you so long Canada?! Good to see your research in Policy Magazine too — I missed it. Thought it was interesting that Denmark has very high turnout and proportional representation. Is that a coincidence do you think? Have you ever asked people if they would turn up to vote more under one voting system versus another? In 1867 was there a refferendum on the matter? With the possibility of a majority somewhere between slim to zero for most election cycles under a proportional representation system, do you think that MPs would, at least eventually, learn to get over their majority fixation and instead. Think changes will be any ones that only benefit the Liberals. We should have a referendum on any changes! I think we should have a n elected senate with an equal number of citizens per senator so that the numbers reflect population. How about polling the questions that really matter on the issue? I’d be curious to see how the numbers compare. 3 of 4 parties ran on a platform of electoral to rally reform. The only party not supporting electoral reform moved feom forming the govt to opposition status. Constitutional experts argue a referendum is not necessary. Changing the system is just the right thing to do. We must have one that ensures all votes are included in the final tally and no party gets into power with a quarter (60% give power with 39% of the vote) of eligible votes. The government has a responsibility to ensure that 50% + of ballots puts a party in power and that we have such an electoral system, not one that keeps only tow parties on power.